In these days of climate change, resource depletion, global trade and industrialized agriculture, many of us are aware of the negative effects our patterns of consumption have. All the same, it’s hard to change one’s behavior. That’s why the Cool Women unite to change their way of living by having loads of fun. They combine glamour with mischief, army prints with pink accessories to make the world a better place for people, nature and animals. One of the reasons it’s so hard to shop sustainably is the limited selection of organic, fair trade or otherwise ethical products stores have for sale. For most items, it is unclear where they were produced and under what circumstances. 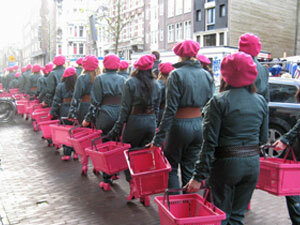 The Cool Women put on their army green suits and pink berets, bring their pink shopping baskets and take to the streets as a shopping army. The first major action took place in late 2007, when the ladies went to three stores in search of fair trade gifts for Santa Claus. After all, how could he give our children presents that may have been made by impoverished children far away? At the store, the Cool Women purchased whatever fair trade gifts they found, and spoke to staff, encouraging them to have more for sale next time. 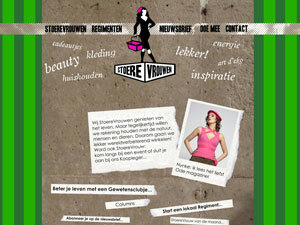 The network of Cool Women consists of a growing number of local regiments. 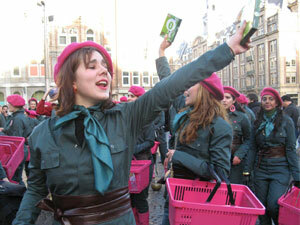 In these groups, young women get together for small scale events on sustainable subjects. For the organic tapas competition, everybody brings along a portion of tapas with purely organic ingredients. The tapas are graded for flavor and beauty and the winner is announced. A ‘feel bad movie’ night has the women watching documentaries about the way farm animals are typically treated, or how Chinese teenagers put in long hours to sew our jeans. After watching the movie, they engage in discussion on how their purchasing decisions might make a difference. Other activities of the regiments are a fair trade high tea, clothes swaps, organic wine tasting and a clothes-repair party.